Since I was so happy with my first Evgeny order, I wanted to complete the Evgeny set and order the rest of the collection. I wasn’t that excited about this second order because unlike the first, these are not brushes that usually trigger my curiosity. I already have a few goat powder brushes and a few sable/kolinsky brushes. However, I still wanted to get them since I love the man behind and I knew they would be good enough for me to use them anyway. The shape in the web store is a bit misleading to me, it looks more tapered and denser, in reality it’s not, it was before wash but then it spreads out. It’s not a bad thing because it makes it more fool-proof and more suitable for any type of product (powder, bronzer), and works with many levels of pigmentation. It is much softer than the Mac 134, this Mac was my HG before I had to stop using it, it became too rough for my skin, or better stated : my skin became too sensitive for that brush. Then I switched to the LY, which is denser and softer than the Mac 134, still not nirvana in terms of softness but so fast and easy to use for me. At that time I wasn’t looking for amazing brushes, just easy to use and that allowed me to apply my bronzer lighting fast so it matched my needs. Today I use mostly squirrel brushes due to the sensitivity of my skin but I also use goat brushes from Hakuhodo, Koyudo, Chikuhodo, RMK, etc… and I will continue to use this Evgeny. My only problem is that for that price I was expecting a softer and slightly denser brush. It’s too big for blush but it makes a nice powder and specially a great bronzer brush. 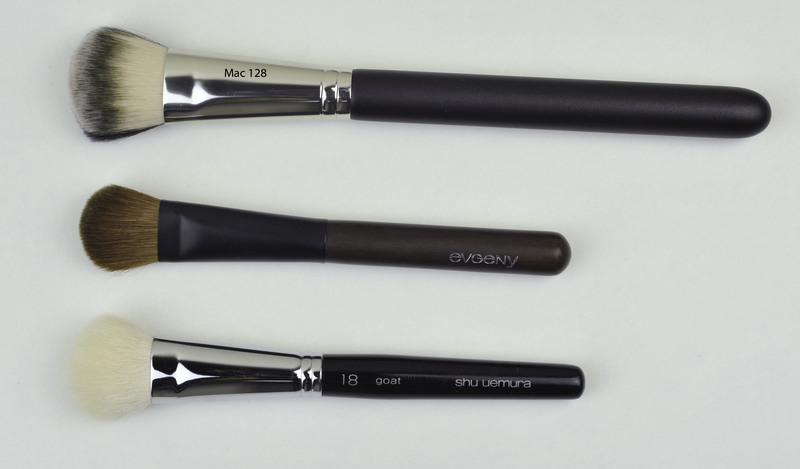 The hair is much better quality than the Mac brushes (134 and 116), actually this Evgeny powder brush is exactly situated between the Hakuhodo LAG and the Koyudo (set) both in terms of quality and softness. 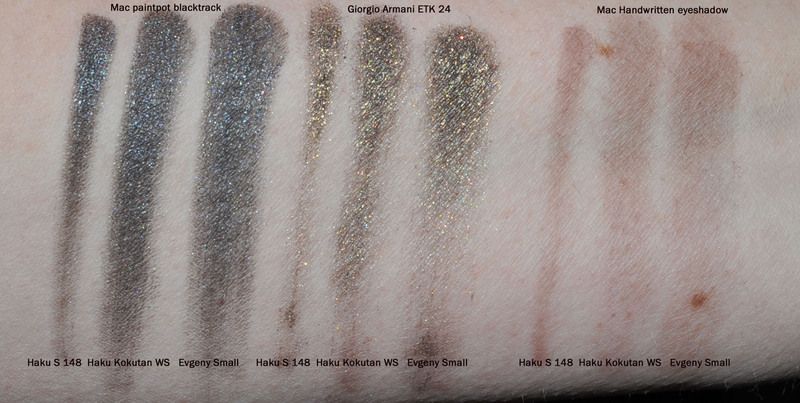 The Hakuhodo LAG (Sokoho goat/synthetic – 94$) feelss very slightly softer than the Evgeny powder, and the Evgeny slightly softer than the Koyudo (goat, price of the full set : 115$). It’s a nice size for the application of bronzer, I do prefer a softer and less dense brush for the application of powder, but it can do both well. It’s my first sable foundation brush and it’s small. I was never drawn towards small foundation brushes since it takes me forever to apply my foundation. When I use it, I apply my foundation without streaky lines but it takes time, specially if you want to use it for a full face application. I know some of you have it so I would like to know if you struggle or if the application is even and smooth for you. I use it with Ellis Faas, Suqqu or By Terry foundations. It leaves a glowy finish and I could just leave it like that but I feel like I still can’t resist to use a bigger buffing brush like the Rae Morris Radiance afterwards. Today I left the application without using the Radiance and no worries. I just like to push the foundation a bit more into the skin. There are pros and cons. The biggest pro is that once I apply my foundation and blend with the same brush, I dip this brush even if it still has some residue from foundation into the Becca concealer (the brush is small enough to fit in the half side of the compact), then I can easily apply and blend the concealer underneath the eyes, take it much further down towards the center of the face and near the sides of the nose, gives a great dimension to the application, the sable hair is soft enough to use underneath the eye area. Once finished with that, I can use the same brush and apply cream blush by small strokes and blend the edges. Then I can just remove blush residue and continue with cream highlighter or cream contour. I did that and did not grab any other brush but the biggest disadvantage is that it takes some time… better not be in a hurry. I think I would really adore it if it was at least twice the size actually. Sable brushes leave less reside on the bristles, it’s easier to jump from one product to the other with minimal cleaning but I still like to wash it regularly, it’s fluffier when clean and more pleasant to use. I did not know how to compare it, I thought maybe the Mac 128 was a bit similar but the bristles of the Mac are much more flexible, I don’t like this Mac for the application of foundation, it’s too floppy, the hair is too fine so the blending is not an easy process. The Shu 18 is nice but again, it’s a small brush. The quality of the sable hair used is great, soft, firm but pleasant both for eyeshadow or concealer application. Sable hair can be used with any type of product, I have swatched a powder, a sparkly and a cream product with all the brushes shown below. They are not always the same material, some are weasel, pony or kolinsky but all could be easily used with any type of product. The Addiction is a bit special since it contains also squirrel hair, I won’t use it with cream since I am not sure it’s a good thing to do but anyway it doesn’t have enough firmness to be used with cream. 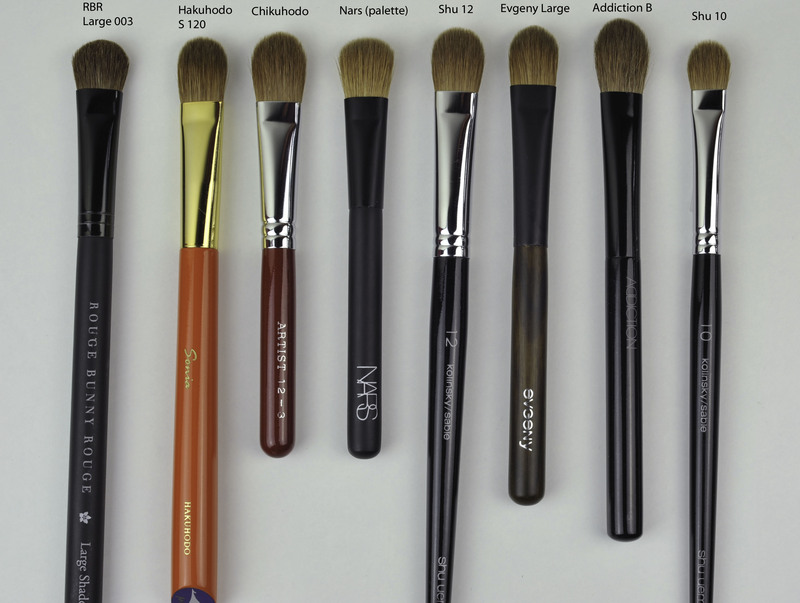 I am not a huge fan of sable brushes -except for the Shu- my preference for a daily use is goat or squirrel but I think it’s also because it’s a habit and that habit could change anytime. 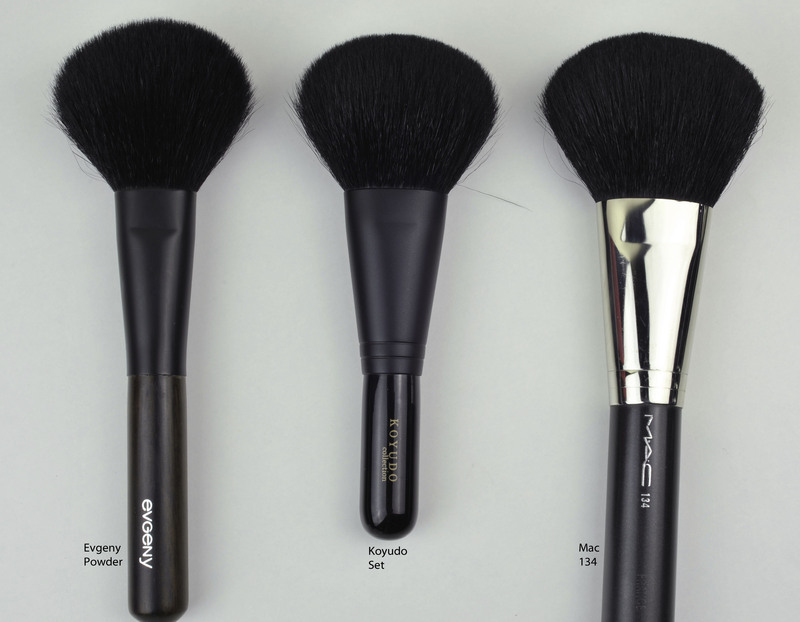 Probably if I was a makeup artist I would have sable brushes to use on models, they may leave a bit less residue on the bristles and one brush works with all products, they are also known to be more enduring. RBR Large 003 (23€) Pony hair. Not very soft, pokes a bit but blends well and picks a lot of product. Hakuhodo S 120 (7560 yen) 100% Kolinsky. Only available in Japan. 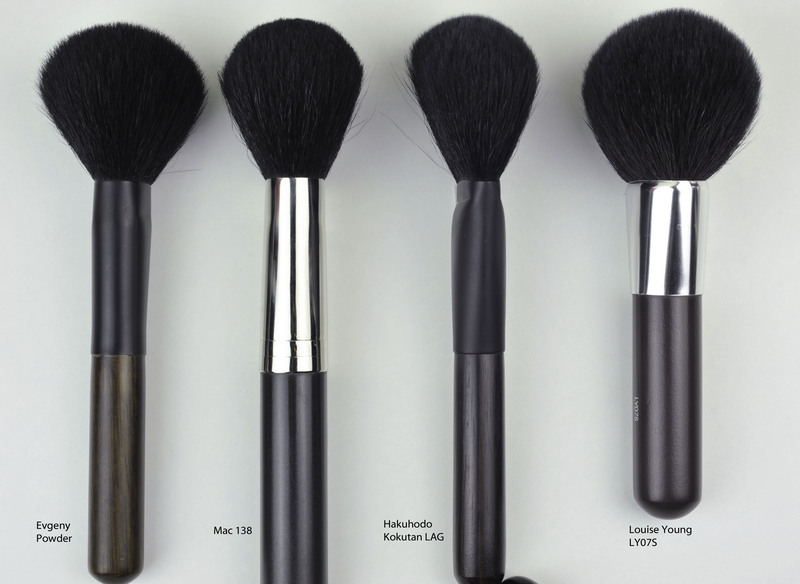 Very soft, firm, keeps its shape, applies evenly, precise enough for base application, not fluffy enough for blending. Doesn’t poke. Chikuhodo 12-3 (3990 yen) 100% Kolinsky. Very soft but not as soft as the Koyudo S 120. Starts to get a bit big for all over application on smaller eyes. More flexible than the S 120, but thicker which makes it also suitable for blending -providing you are looking for a flat-ish blending brush. Doesn’t poke. Nars (from the palette “And God created the woman”) Sable ? Not sure… It’s a decent brush for a set, not as soft as the other options but fluffy and nice for all over application and blending. Not my favorite but a brush we can use. Shu Uemura 12 (100 GBP) Kolinsky/sable. It’s very similar to Hakuhodo S 120 in terms of softness but it’s much fuller. Doesn’t poke. Evgeny Large (45cad) Rusian sable. Feels similar to the Chikuhodo 12-3, soft and firm, comes to a point so you can use it a bit more precisely. Doesn’t poke but it’s quite firm. Addiction B (3780 yen) Weasel / brown squirrel. 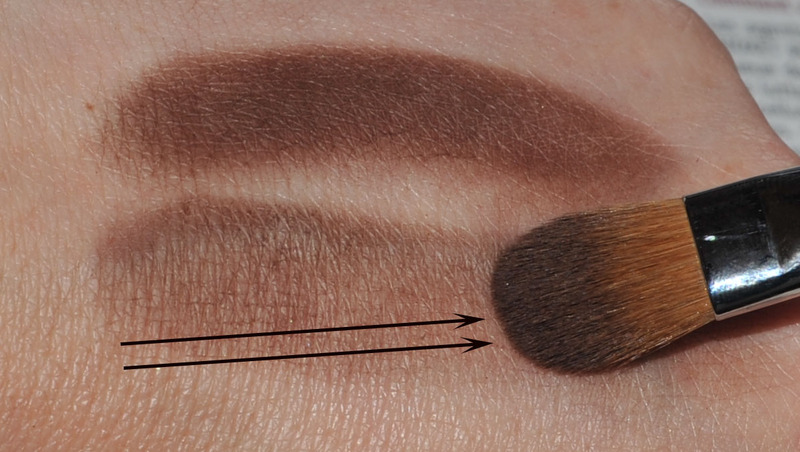 It’s soft and fluffy for a flat-ish brush, it’s more a blender than a base application, you can use it for base application but it’s very flexible and can start to be too big for most of us to use on the eyes. Doesn’t poke. Shu Uemura 10 (52.50GBP) Kolinsky/sable. A smaller version of the Shu 12, soft but more firm. Doesn’t poke. The result with the Shu and the Evgeny brushes is the same on both eyes when I try them, it’s just the process that is a bit different. For the sparkly product, again the Shu does it better. 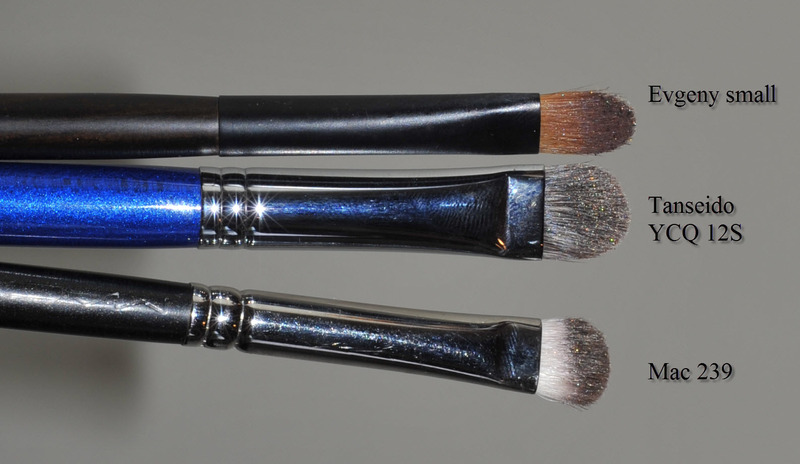 That said, both the Evgeny brushes do a great job with any type of product. It doesn’t really show on the swatches but on the eyes, the applications are even and it packs the product heavily enough, no complaints. With the Mac paintpot, it’s again the Shu that packs the most but you will be able to work with the Evgeny as well, no worries at all. Since the Shu is a bit thicker, I find the blending easier. Shu Uemura 10 (52.50GBP) Kolinsky/sable. Evgeny small (40 cad) Rusian sable. Hakuhodo Kokutan WS (3675 yen) Weasel. Hakuhodo S 148 (3150 yen) Weasel. 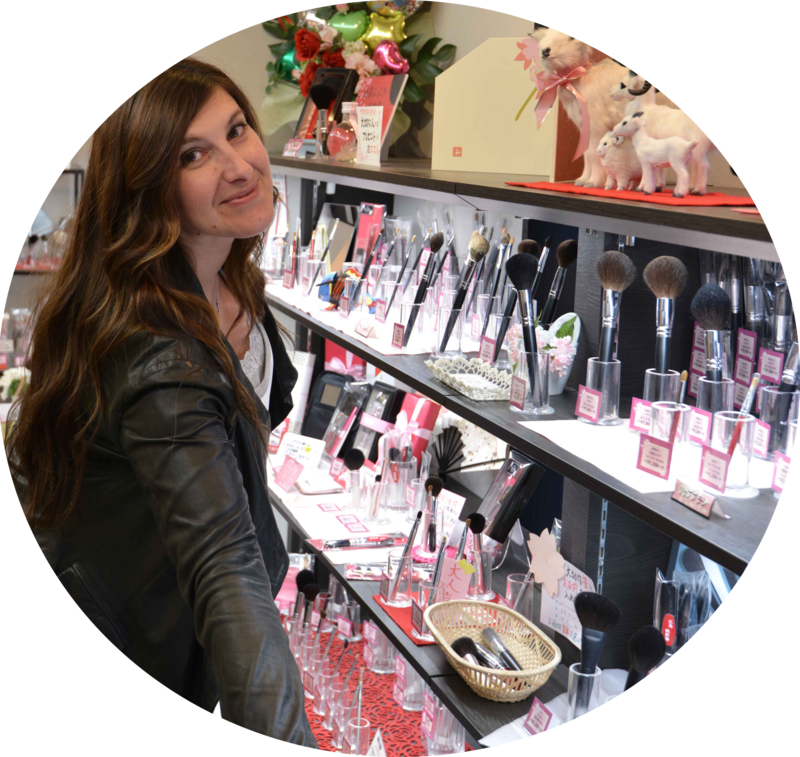 I apply the eyeshadow in two different ways, either patting or sliding the product downwards or in windshield motions, you can put more intensity when you use it in a windshield motion, just depending on the brushes, specially if the bristles have a lot of spring they can cause fallout. 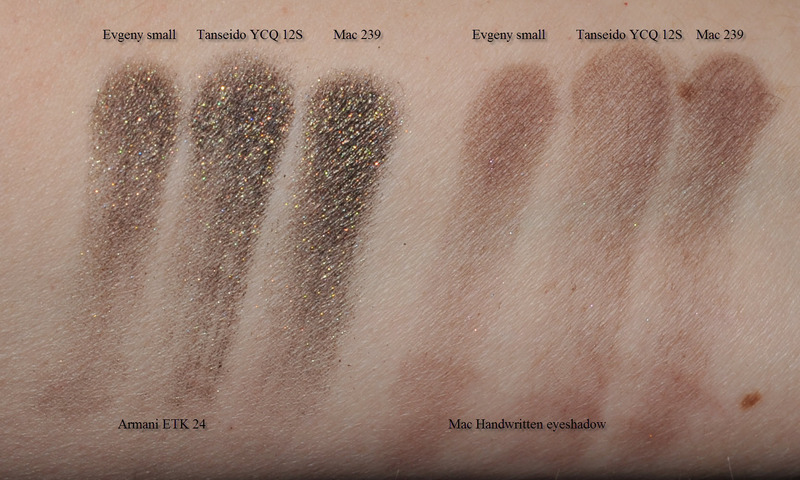 I have also swatched the same products with completely different materials, sable (Evgeny), squirrel (Tanseido) and goat (Mac). For me the difference is not that huge, it will be a matter of personal preference and budget. The three perform well enough with powder or sparkly products. 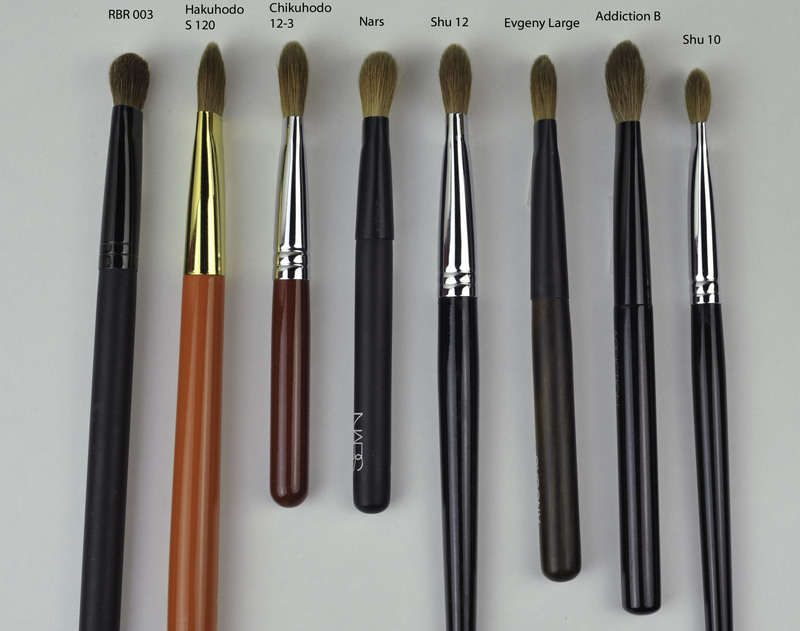 My preference goes to the Shu brushes, but the extra performance they deliver also comes with a scary extraordinary price, the Evgeny are a nice alternative if you want great quality sable brushes. 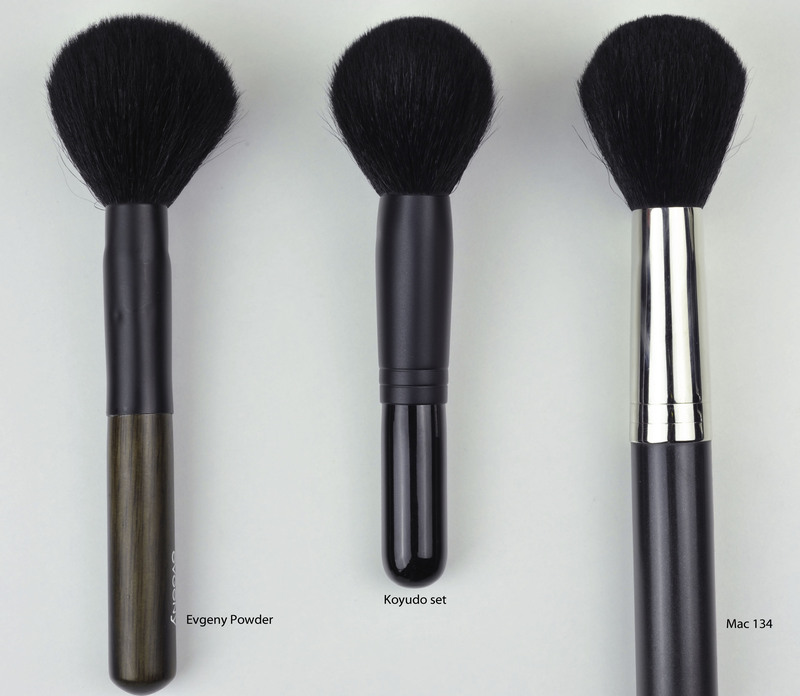 Evgeny brushes : Powder, Foundation and Eyeshadow S and L was last modified: August 4th, 2013 by Sonia G.
thank you, sonia for the review. From all the line, I think the blending eye brush is the best and most unique. For brush collectors, the other ones offer no surprise even I like very much the overall design of the line. Very in depth review! I check your blogg every day! I just love it! Thank you Kim, very kind of you ! you are absolutely right, the Armani looks very similar and I wanted to try it for a long time, the only reason I don’t own it today is because when looking at them at the counters, they were all in such a bad shape that I wasn’t sure if I had to get it. Also I asked the person at the Armani counter and he had no idea if it was sable or synthetic -where to me it looked clearly like natural bristles-, I will check it out in Japan if I find it. One that I may take in Japan is the Chikuhodo equivalent (GS-12 I believe), we’ll see, I am very tempted 😉 Then I will be able to compare, so far it is my only sable foundation brush. Waouhhhhhh!!!!! you will have to update the HG brushes post ahahahaha!!! I’m AMAZED by all the work you do!!!! tha hakuhodo S120 is not avalaible on CDjapan? and how would you translate poke in french? pique? Since I’ve known your blog and completely changed my brushes, my skin (very sensitive) thanks you everyday! I might go to London in June (while you’ll be in Japan) so if you want anything from there, email me your list!!!! By the way, can you tell us what is your shopping wish list that you plan to buy in Japan? I am not sure what I will get in Japan yet, probably “one of each” brand, I want to swatch and then decide, they have many brands that we don’t have here, being able to swatch many products will allow me to choose the ones I really will use. Basically you go to Ichibankao and you look at the brands, I will try them all 😀 I can’t wait to see Laduree ! I will definitely get some more Addiction products and the new Suqqu collection, for the rest, let’s wait and see how it works out ! The problem is that I don’t have much time to research. I will update you every day if I can ! 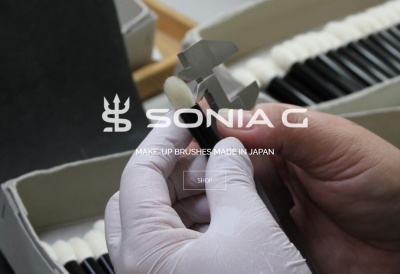 Hi Sonia, I read above that you wanted to try out the Chikuhodo GS-12 for foundation, I don’t know if it helps but I have been reading a few Chinese blogs that says the foundation brush is not as amazing as one would believe, since it takes a lot of time and care to achieve a streak-free finish. It’s more comparable to the flat paddle-type of foundation brush more than the flat-topped ones, and it seems to be quite thin. Also, it seems to soak up foundation quite a bit and separate into bunches/strands after use… I’m not sure if that’s true since I do not have the brush and cannot testify to it but I thought I’d share what I’ve read? LOL. Nice trip dear, and maybe you’ll get to check out the brush first-hand!! I bought the whole set also, and agree about the powder brush. Pre wash it was a totally different shape, and I felt it was softer before I washed it. However, I have to say I found the perfect use for it – I use it with my Hourglass Ambient Powders (Dim and Diffused, that I use all over as a finishing powder) and it’s PERFECT for that. I will always love my Suqqu face brush for my loose Suqqu powder (I save it to exclusively use with that), but this powder brush picks those Hourglass powders up perfectly. Handy that it’s between the Kokutan LAG and Koyudo set, since those are the 3 I’ll have! I don’t use my Louise Young anymore, that thing sheds like crazy. I even contacted them and they sent another one, that one shed too. I got tired of picking little hairs off my face every morning! I do still have it for applying bronzer to my neck and décolleté, it works well for that and the shedding doesn’t bother me when it’s not on my face. Amazing how scratchy it feels now that I know how soft brushes can be. As for the foundation brush, I actually use it to apply foundation before blending it with either my Fu-Pa07 or Radiance. It helps keep the white brushes a little cleaner (from your recommendation, which was a great one! ), but I can’t see using it as my only foundation brush. The only foundation brush that is that small that I love is the Shiseido, but I can’t use the same sliding application so it doesn’t work for me. 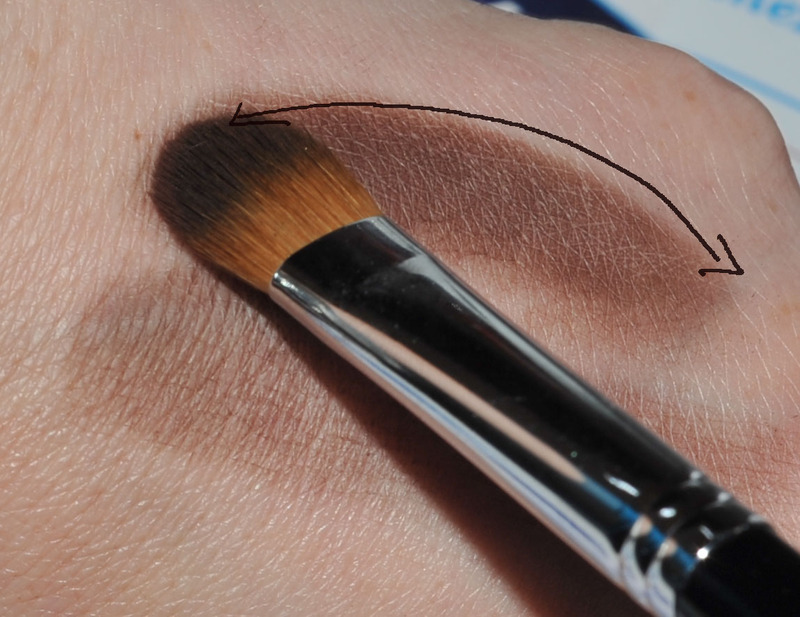 Good tip about dipping it into concealer after, I’m going to try that. And now that you mention it, it would be the perfect cream blush or contour applicator also. 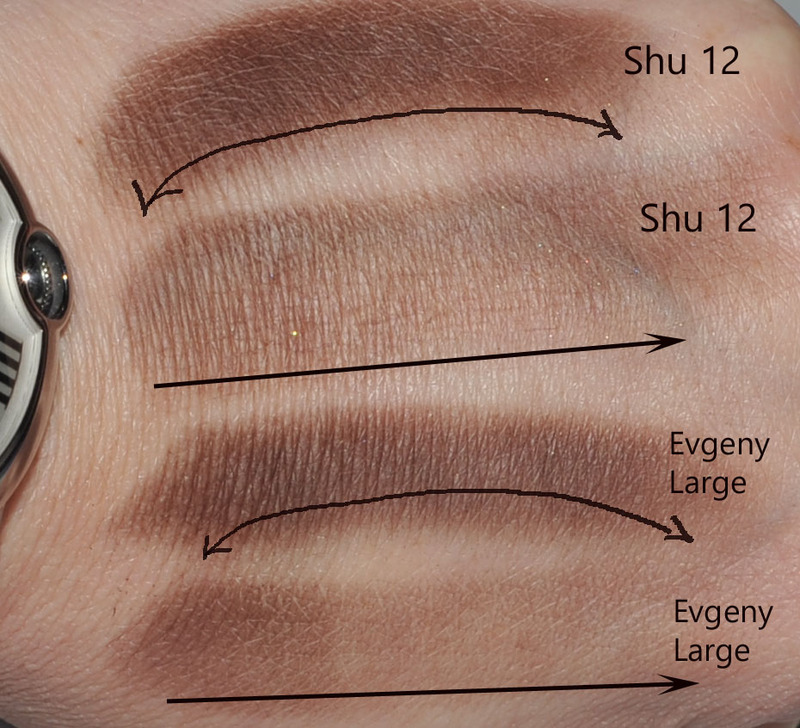 I like the large shadow brush to apply my beloved Lorac eye primer, and I love the small shadow brush for precise application of my more glittery shadows. I do have to say that I am completely obsessed with both the crease brush and blending brush. I will use them every day! I also love the density of the blush brush, I tend to prefer softer and less dense blush brushes but the Evgeny is great for the less pigmented blushes that I feel like I have to apply 10 times with the Suqqu. Overall, I think it’s a really nice set that I’m happy to have. The kissettes are absolutely adorable too!! Above everything else, what a GREAT guy Evgeny is. I emailed back and forth with him several times, I’m very impressed by him and was even happier to be supporting someone like him. And OMG – 3 DAYS to Japan!!! YAY!!! I am both excited and terrified of what you will discover…….. Thank you so much for your feedback on them ! I think you will have the grey squirrel Koyudo set, the one I was talking about here is the Koyudo goat (the black one reviewed recently), I am not sure you are referring to this one or the red one. How are you liking the Hourglass powders ? I did not see then in Zuneta when I wanted to order them. I second you on how great Evgeny is, I wish he will launch his own cosmetic line shortly. The cash, the railpass, the business cards, the schedule, I can tell you : you have to plan that in advance if you don’t want to be running around like a helicopter !!! Great review! I love my Evgeny blending brush. I acquired it on your recommendation, and it has quickly become HG for me. Why is it, though, that every time I find brushes I love, it just makes me want to find even more brushes I love! I am exactly the same way with designer jeans. Clearly I need to find a less expensive passion! The Shu x 2 are still the winner! I wonder which brush company make it for Shu. I LOVE the Hourglass powders!!! I have ended up getting all of them except for the white one (Ethereal, I think), that one didn’t appeal to me. What I love is that they’re all so different, and I use them for different things and effects. Dim and Diffused I use as an all over finishing powder, while Luminous, Radiant and Mood I use specifically as highlighters, they’re all very different from each other. Luminous is probably my favorite highlighter right now. They are so finely milled and smooth, and the finish on all of them is amazing. I’m a powder snob and I love them! If you ever see them in person definitely stop and check them out. Not surprisingly I do not recommend the scratchy brush they sell to go with it, I felt it in the store and knew I didn’t want it, it applied it too heavily in my opinion also. 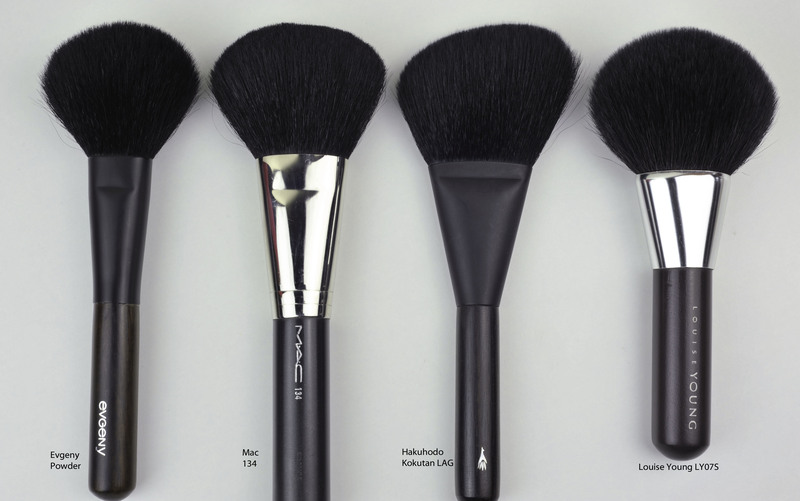 But I’ve become a serious brush snob too (I think I’m in good company on that one!) so take that into consideration. Dena I hear you, I have that exact same problem!! It makes no sense, why does aquiring great brushes make me need more? It’s a disease. Luckily I’ve stayed away from designer jeans…..so far. Sonia, I can’t even imagine!!!! I hope you get it all together so you can relax and just be excited!!!! i think sable hair brushes are more suitable for cream products! i love using them for applying concealer and cream e/s! 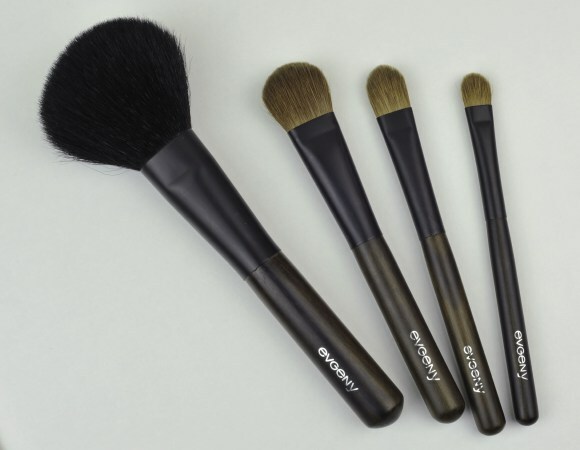 Love all your complete reviews about the Evgeny brushes (and the ones about Suqqu brushes). You explain them in a way that even a beginner (in the makeup world) like me could understand everything so easily. The pictures are my favorite, so clear, so informative, and full of beautiful brushes. A real eye candy!! The only problem is, the dark background and black blog text are making my reading capability very limited. I have to look really hard, and read very slowly, to capture everything that you said. I don’t know how the other readers cope with it, but I do wish for easier texts to read. Maybe you might wanna consider using gray letters instead of black. But that’s just a suggestion. Hope you don’t mind me saying it. Of course I don’t mind you saying, to be honest I have the same problem and some browsers even display it worse. So I have planned something and started with the help of my boyfriend but right now he is fully booked with the care of our sick dog, he doesn’t even have a minute for himself at the moment. when this crazy situation calms down he will continue what we started and its on white background. What an excellent review, Sonia. I’m looking forward to reading your perceptions of Japan and those Kashoen brushes.